William K. Hancock, Survey of British Commonwealth Affairs (London: Oxford University Press, 1940). Murray McCully, “Speech to China Foreign Affairs University Beijing,” Beehive.govt.nz, 6 April 2012. Available: https://www.beehive.govt.nz/speech/speech-china-foreign-affairs-university-beijing. [Accessed 8 June 2016]. Barker, Fiona, and McMillan, Kate. Access to Electoral Rights: New Zealand. European University Institute and European Union Democracy Observatory, 2016. Available: http://cadmus.eui.eu/handle/1814/42884. Department of Internal Affairs. Choice Whiriwhiria. The New Zealand Citizenship Story. Te Kōrero Raraunga o Aotearoa. 2014. 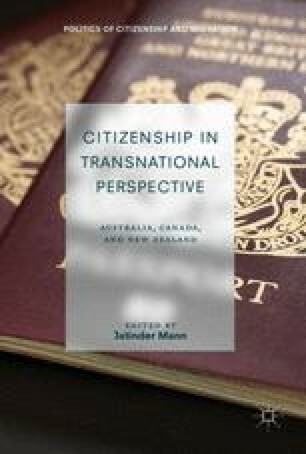 Available: https://www.dia.govt.nz/Services-Citizenship-Choice-The-New-Zealand-citizenship-story. du Fresne, Karl. “Two flags, 4.5 Million Differing Views of Them.” Stuff.co.nz. 18 March 2016. Available: http://www.stuff.co.nz/dominion-post/comment/columnists/77973239/two-flags-45-million-differing-views-of-them. [Accessed 5 June 2016]. Earnest, David. “Noncitizen Voting Rights: A Survey of an Emerging Democratic Norm.” Paper prepared for delivery at the American Political Science Association meeting, 2003. Available: http://ww2.odu.edu/~dearnest/pdfs/Earnest_APSA_2003.pdf. European Union Democracy Observatory on Citizenship. “Conditions for Electoral Rights.” 2015. Available: http://eudo-citizenship.eu/electoral-rights/conditions-for-electoral-rights-2015. [Accessed 8 June 2016]. Immigration New Zealand. “Operational Manual.” Ministry of Business, Innovation and Employment, Wellington, 2016. Available: http://onlineservices.immigration.govt.nz/opsmanual/. McCully, Murray. “Speech to China Foreign Affairs University Beijing.” Beehive.govt.nz, 6 April 2012. Available: https://www.beehive.govt.nz/speech/speech-china-foreign-affairs-university-beijing. [Accessed 8 June 2016]. McMillan, Kate and Hood, Anna. Country Report: New Zealand Citizenship. Italy: European University Institute and European Democracy Observatory, 2016. Available: http://cadmus.eui.eu/handle/1814/42648. Ministry of Business, Innovation and Employment. “Vote Immigration: Briefing to the Incoming Minister.” MBIE, Wellington. Available: http://www.mbie.govt.nz/publications-research/publications/mbie-corporate/Immigration.pdf. Ministry of Social Development. “A-Z Benefits and Payments.” Work and Income, Wellington, 2016. Available: http://www.workandincome.govt.nz/products/a-z-benefits/index.html. Ministry of Social Development. “Residency Requirements for New Zealand Benefits and Pensions.” Work and Income, Wellington, 2016. Available: http://www.workandincome.govt.nz/pensions/travelling-or-moving/moving-to-nz/residency-requirements-for-new-zealand-benefits-and-pensions.html#null. New Zealand Department of Statistics. The Population of New Zealand 1974, United Nations Committee for International Coordination of National Research in Demography Series. Wellington: Department of Statistics, 1974. Available: http://www.cicred.org/Eng/Publications/pdf/c-c37.pdf. [Accessed 9 June 2016]. New Zealand Government Flag Project. “What New Zealand Stands for |standfor.co.nz.” Available: http://www.standfor.co.nz/. [Accessed 13 June 2016]. New Zealand Government, “Being stripped of New Zealand Citizenship.” 2016. Available: https://www.govt.nz/browse/nz-passports-and-citizenship/changing-your-nz-citizenship/being-stripped-of-nz-citizenship/. Sachdeva, Sam. “Winston Peters: Only NZ Citizens Should be Able to Vote in Flag Referendum.” Stuff.co.nz, 28 February 2016. Available: http://www.stuff.co.nz/national/politics/77355528/Winston-Peters-only-NZ-citizens-should-be-able-to-vote-in-flag-referendum. [Accessed 4 June 2016]. Sawyer, Caroline and Wray, Helena. EUDO Citizenship Observatory Country Report: United Kingdom. Florence: European Union Institute, 2013. Available: http://cadmus.eui.eu/bitstream/handle/1814/33839/EUDO-CIT_2014_01_UK.pdf?sequence=1. Statistics New Zealand. “2013 Census Quick Stats About Culture and Identity.” 2014. Available: http://www.stats.govt.nz/Census/2013-census/profile-and-summary-reports/quickstats-culture-identity/birthplace.aspx.